“A Pilgrim from the East”, a documentary about Dr. Daryoush Shayegan, and directed by Hassan Khademi is in the last stages of production. Tehran Auction held its 10th auction, offering Contemporary Iranian Art at the Azadi hotel, Tehran, Iran. Hassan Khademi produced Tehran Auction’s advertising films like the past. Iranian artist Alireza Asanloo uses his poetic eye to create paintings and sculptures that symbolize the resilience of women. 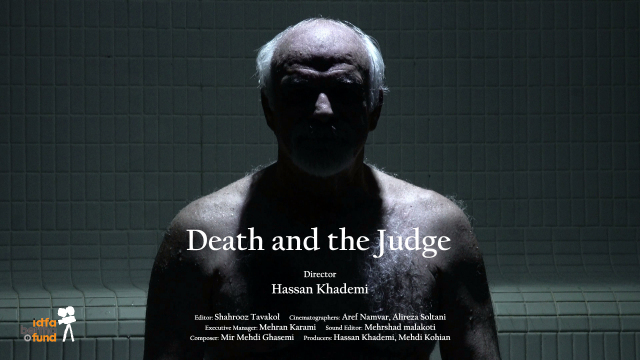 Hassan Khademi has produced a clip for him to promote his works. Death and the Judge screened in 26 cinemas in North America. In 52th of Docunight which was dedicated to Death and the Judge, this film was screened in LA, Washington, New York, Toronto, Vancouver, Chicago, Seattle, San Francisco, Boston, San Diego, Minneapolis, Durham, Albany, Irvine, Eugene, Pittsburgh, State College, Bloomington, Ann Arbor, Calgary, Waterloo. Hamilton, Charlotte in the first days of Dec 2018. It has always been questionable for the director, Hassan Khademi, whether the person who orders the execution of thousands of people is disgusting or he is an ordinary people who does his job accurately. Death and the judge wants to answer this question. It should be noted that the production a film in the field of retaliation and execution is very challenging in Iran and director should respect the political and social red lines. It took four years to make the film and during these years, the film director has accompanied the judge. Iran’s most famed and feared judge has sentenced around 4,000 people to death, more than any other judge in the country’s history. This powerful documentary offers unique access into the professional and private lives of Iran’s most feared legal official. It constructs an intimate yet chilling portrait of a man who spends his days confronting decisions about life and death, both in the court room and in the course of his own life. “I can’t sleep at night,” admits Azizmohammadi. However, it is not the fact that he has condemned 4000 people to death that keeps him awake; rather, he worries about the cost of construction of his new house. Azizmohammadi is the most famous criminal court judge in Iran, and has served for over 4 decades, presiding over countless horrifying crimes. The documentary has directed by Hassan Khademi. It is in the last stage of production. Darioush Shayegan is a polymath with a breadth of knowledge encompassing both east and west. He was brought up in Iran, attended boarding school in England, studied philosophy at the Sorbonne in Paris, literature in Switzerland and was professor of Indian studies and comparative philosophy at Tehran university between 1968 and 1979. He has written 17 books — mostly in French — covering Hinduism, Sufism, Islamic societies, Persian poetry and cultural schizophrenia. The first of its kind in Iran, Tehran Auction was launched in 2012 as an independent and private initiative to introduce the best of Iranian art ranging from established and emerging Iranian artists to Iranian art collectors and global audience. Hassan Khademi has made the promotional videos for Tehran Auction during these years. He has produced eight films for Tehran Auction. This is the story of the Iranian famous photo journalist, Hossein Fatemi, who has over twenty years of experience. Fatemi used to be Iran ex-president Mahmood Ahmadi Nejad’s photographer, but then was recruited as the U.S Army’s photographer in Afghanistan. He then returned back to Iran to work on an independent project called the “An Iranian Journey”, Which depicts Iran in a different, more than conveys Iran as anti-USA chants, Nuclear Energy, Controversial sermons in Fridays Prayer by hard liners, and obligatory hijab. Some years later, Fatemi received a prestigious award from the World Press Photo. Following “An Iranian Journey”, he was forced to leave Iran in 2013 and is now a homeless photographer who is travelling the world, taking photos of both goodness and disarray, particularly in the Middle East. In Hossein Fatemi’s photos, the Middles East is depicted by fundamentalism like ISIS and Taliban, fight and bloodshed, drought and famine. Throughout, Hossein Fatemi is the story-teller of such misery. Congruent with his depiction of the Middles East, Hossein Fatemi’s private life is also plagued with misery. He does not have a permanent residence, has gotten divorced from his wife, lived with his sixteen year old son for only two years and thus watched him grow up by looking at his pictures and by talking to him over the phone. He is lacking financially, and barely makes ends meet. He always advises his son, who enjoys photography, to pick another career. The story of Hossein Fatemi ultimately encapsulates an individual who left everything behind and sacrificed all he had to capture the suffering of humankind. This project is in the filming stage and for five years, filmmaker Hassan Khademi has been working alongside Hossein Fatemi and has been documenting various aspects of his life. We have finished approximately 50% of the documentary. We need financial assistance to continue and finish this unique project.